I put together my third current events report for 5th grade. It's about the rising minimum wage. On New Year’s Day the minimum wage, which is the lowest wage permitted by law, went up in 13 states. The minimum wage can be set on a national, state, or even local level. Before this the national minimum wage was $7.25 an hour. The reason we need the minimum wage is because workers from places like McDonald’s, Wendy’s, Burger King, and Wal-Mart can’t live off the money they are paid. Even though most of the increases in the minimum wage are less then fifteen cents, the voters in SeaTac, Washington have decided to raise the local minimum wage to $15.00 an hour. A judge ruled that the vote would apply to only some workers, but it was a bold effort. There are other counties in Maryland, D.C., and California that are going to raise their minimum wage. California will bump its state wage to $9.00; New Jersey’s state wage went up to $8.25; Connecticut to $8.70; Rhode Island and New York to $8.00. The minimum wage also increased in Arizona, Colorado, Florida, Missouri, Montana, Ohio, Oregon, Vermont and Washington. Although senators and the president have made proposals for raising the national minimum wage to $10.10, nothing that big happens quickly in the White House. ABC took a poll of what Americans think about the minimum wage. The study shows that 66% of Americans think the minimum wage should be raised. Here are the rates Americans think the minimum wage should be at: 2% of Americans think there shouldn’t be any minimum wage. 13% of Americans think there should be a lower minimum wage. 34% of Americans think the minimum wage should be in between $7.26 and $9. 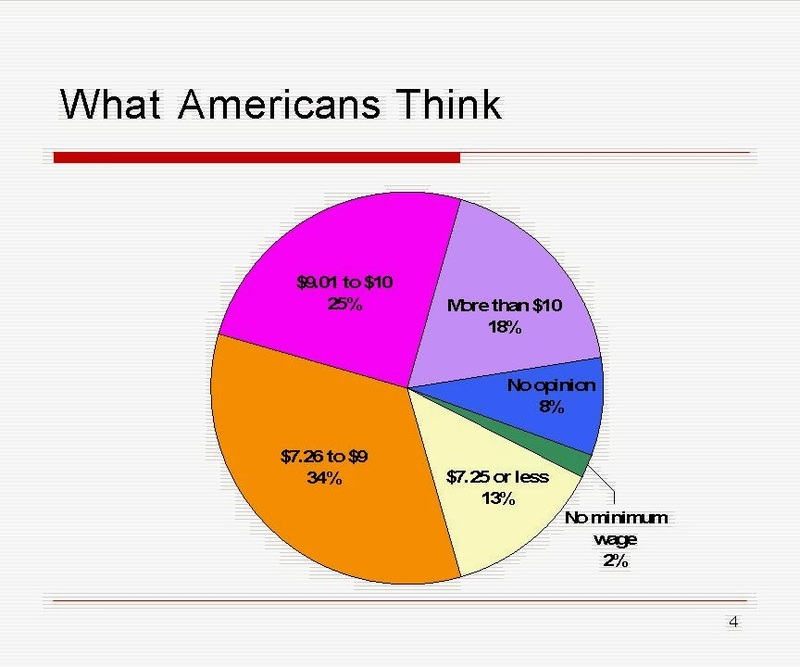 25% of Americans think the minimum wage should be between $9 and $10. 18% of Americans think the minimum wage should be $10 or more. 8% have no opinion. Some people think that the minimum wage is a bad idea because it will lead to businesses cutting workers because they can’t pay them. However, there is a lot of evidence that the minimum wage has very little to no adverse affect on employment. It is not possible to do a controlled study on the effects of minimum wage because an area doesn’t increase and decrease its minimum wage at the same time and there could be other factors we’re not considering. Despite this there have been many occasions when one state increased their minimum wage while a neighboring state did not, and the state with the higher minimum wage didn’t have a higher unemployment rate.